Power hardly ever leaves gently. Entrenched and arrogant it will hold on until it is absolutely forced out or forced to change.The clerical caste in Cathollicism is the classic example.Convinced that it alone can ‘run” the Catholic church it continues to alienate loyal members of the faithful. On the global stage, we see the despicable remnant of the Mubarak regime turn its guns on peaceful protesters who seek a vibrant democracy where the military serves at the behest of the people..so far about 30 protesters have been shot dead. Here the hypocritical hegemon, the United States continues to fund the army to the tune of $1.3 billion per year.Late to the party, very late in its putative defence of democracy the US continues to waffle.They want a stable defender of its interests in the Middle East, read Israel. Charles Pierce’s evisceration of the growing boobocracy in America. A book on the rising anti-intellectualism in a ‘dumbing-down’ of the nation which used to honour science as a cardinal discipline. Now it is aa country where certifiable dopes like Glenn Beck and Anne Coulter can command an audience and Sarah Palin can be on a presidential ticket. And we might add a phony war hero like John McCain can be taken seriously as a future president. War hero, no? A guy who rained death on innocent Vietnamese, came home and dumped his wife who stood by him but was mangled in an auto accident. Then was caught up in the Savings and Loans scandal. Oh yeah it was ancient history—1991 and because of TV and Football we can’t remember that far back. Pierce is hilarious in documenting the CREATION museum where the dinosaurs wear saddles but is deadly serious when unpacking the Schiavo case where the BUSH Evangelicals almost prevented a husband from advising a Do NOT Resuscitate for his brain dead wife. Maybe the best part of the book is the evisceration of the C student who got into Yale on Daddy’s coat tails and became a ” War President” even though he bailed in the Vietnam years.His description of Bush is the best I have ever read: He is the frat boy who goes to the pub with you, ducks out to the washroom to avoid the next round then starts a fight with the tackle on the football team —which you have to finish. This is a terribly sad indictment of a country where the best selling religious book is a phantasm called Late Great Planet Earth—50 million sold on the end times!Pure illiterate biblical bunkum. 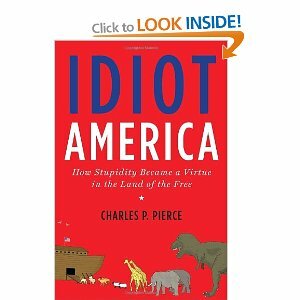 IDIOT AMERICA which also contains some of the smartest people in the world. PBS recently ran a fascinating 2 hour documentary on the HUNT for NAZIS in the postwar era. It was as per usual excellent documentary fare from the American public broadcaster. It included the voices of those I was long acquainted with in my long work on the Holocaust—Allan Ryan, the Klarsfelds, Wiesenthal etc. And then came the haunting face of Rafi Eitan. Now I realize most people would not know about this odious man but I knew him right away. 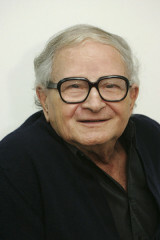 Eitan was a longtime Israeli Mossad agent who was instrumental in the capture of “I was only taking orders”, the scurrilous Adolf Eichmann, executed by the Jewish state in 1961. The latter was dumb enough to keep the family name after he was spirited out of war-torn Europe by the disgusting Croatian priest Draganovic. This is another story but it was the priest who using clerical safe houses aided the escape of many monsters to that other fascist Republic, Argentina. Eitan nabbed Eichmann as he was returning to The House on Garibaldi House, (a great book by prosecutor Gideon Hausner) in Buenos Aires. Well worth a read. I despised these Nazis and devoted much of my teaching life to a study of the Holocaust.it was an act of reparation for the long Catholic “Teaching of Contempt” for Judaism which paved the way for the Holocaust. So here’s Eitan, justifiably glowing, recounting the tale of capturing Eichmann. It was a sentiment I could relish and appreciate—if I did not know Rafi Eitan, the Arab racistm who obviously learned little about racism in the Hitler years.The latter was long associated with the ultimate Rab racist,ariel sharon.He had long been active in anti-arab activity supporting the obnoxious settlers who are destroying peace prosoects in Israel. What an irony! here’s that Mossad man age 90 still with people on his knees, this time Palestinians. Where is FRANK Magazine when we really need it? The cheeky satirical rag always ran a necessary send up on Remembrance Day.They called it Poppy Watch. see who could spot the firs uber-Canadian to sport it in Parliament. Usually Preston Manning would win. 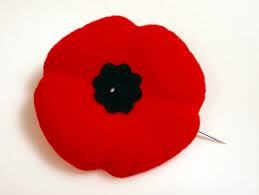 Now it’s Stephen Harper who cavalierly will spend $20 billion on war making and the armed forces in the next 20 years. I long ago gave up hope for university presidents to show a modicum of courage on contemporary issues. Most have become glorified fund raisers and will not do anything to jeopardize their funding.Even at the cost of intellectual truth, open ended dialogue and free speech. Geez, that is what a university should stand for—ever since Socrates walked in the agora. A few years ago the president of my alma mater, the U of T, David Naylor took a free trip to Israel—pure propaganda.Then he came back and tried in 2008 to sabotage the growing anti-Israeli apartheid Week on his own campus.and he was not alobne the presidents of Carleton,Wilfrid Laurier and Carleton banned the 2009 poster. Now would this have anything to do with donations to these universities? Over two hundred students gathered at Carleton University on Monday to voice their outrage at the university administration’s sponsorship of the Jewish National Fund’s fundraising dinner in Ottawa. The demonstration, which was organized by Students Against Israeli Apartheid, denounced the University president’s strong support for the JNF, which has openly worked to implement Zionist goals in Palestine. the ‘Canadian Park’ on Palestinian land in the occupied West Bank. Bill Skidmore is a professor of human rights at Carleton University. administration has yet to announce on whether it will withdraw its sponsorship or not. So the Fordists at Toronto City Hall want to accelerate the race to the bottom by contracting out about 1000 cleaning jobs to low-wage contractors.. These hard working people are looking at going from barely a living wage to a minimum age. There always be piranhas taking advantage of new immigrants, undocumented workers and refugees. But a great city will not allow this. I gave a deputation to the Community Development and Recreation Committee n NOV 4 rejecting this. How will this attack on the se workers promote social cohesion?The right wing councillor whom Ford placed in charge of this committee george Mammoliti refused to chair the meeting and walked out and referred to those deputing and the committee itself as “a socialist dumping ground.” That is how out of it this guy is. I gave my deputation to the largely progressive councillors. I represented the Roman Catholic tradition as it pertains to workers and the Living Wage. Every effort must therefore be made that fathers of families receive a wage large enough to meet ordinary family needs adequately. But if this cannot always be done under existing circumstances, social justice demands that changes be introduced as soon as possible whereby such a wage will be assured to every adult workingman (No. 71). The first claim of labor, which takes priority over any claim of the owners to profits, respects the right to a living wage. By the term living wage we understand a wage sufficient not merely for the decent support of the workingman himself but also of his family. A wage so low that it must be supplemented by the wage of wife and mother or by the children of the family before it can provide adequate food, clothing, and shelter together with essential spiritual and cultural needs cannot be regarded as a living wage. Furthermore, a living wage means sufficient income to meet not merely the present necessities of life but those of unemployment, sickness, death, and old age as well. One of the funniest suggestions yet from the blogosphere was that American congressional reps wear jackets like those on the NASCAR loop. The colours would represent what corporate sponsors “own” these trolls. Years ago the rabid Nixon attack dog and right wing Catholic Pat Buchanan did hit a homw run—usually everybody is right about something–when he described Congress as :Israeli Occupied Terriory. The cantankerous Buchanan pointed out the obvious—alone virtually in the world, American legislators, largely because of the lingering effects of the country’s deep evangelical and anti-intellectual history–Americans should support modern Israel,whatever it does. Now it is well known that there are 5 lobbyists for every Congressman and they literally have bought and paid for a majority of these hacks. So why not identify them with bright coloured NASCAR-type vests.